Black Eyed Pea Dip is perfect for New Year’s Day or any time of the year! This healthy dish is made with corn, bell pepper, avocado, and a tangy dressing. Did you know that in the Southern United States, eating black eyed peas on New Year’s Day is thought to bring good luck? The legumes are traditionally eaten with pork and hot chili sauce. But instead, I like to eat black eyed peas in a chunky dip with tortilla chips. Or you can eat this dish on its own like a salad. Any way you serve it, Black Eyed Pea Dip is healthy and flavorful. Black Eyed Pea Dip is zesty and flavorful. The key ingredient I use to make it which I always keep in my pantry is TABASCO® Brand Pepper Sauce. It enhances the flavors of the recipe without overpowering it. And it’s so versatile since it only contains three ingredients: aged red peppers, salt, and distilled vinegar. Or if you want to change up the flavor, you’ll also enjoy TABASCO® Green Jalapeño Sauce and TABASCO® Chipotle Pepper Sauce. The Green is milder, while the Chipotle is more smoky. Besides using these sauces in Black Eyed Pea Dip, they are great on Roasted Sweet Potato Tacos and Tofu Scramble Breakfast Tostadas. I also like to add TABASCO® to Spicy Mango Fried Rice and Chickpea Stir Fry. The flavors work well with all types of cuisines. Not only is TABASCO® Sauce an ingredient in Black Eyed Pea Dip, I also offer some on the side for those who want some extra heat. I buy TABASCO® at my local Walmart. It’s located in the aisle with the BBQ sauces. In addition, Ibotta currently has an offer to get $1 off any flavor 5 ounces or larger. And this year marks TABASCO® Brand’s 150th anniversary. Every bottle comes out of Avery Island, Louisiana. Black Eyed Pea Dip is a delicious combination of flavors and textures. Black eyed peas, also called cowpeas, are high in protein and fiber. They also contain high levels of magnesium, calcium, and iron. Besides this recipe, you can also add them to any dish that calls for beans. 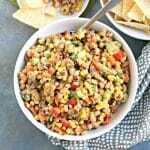 I love the combination of black eyed peas with corn in this dip. And it also contains red bell pepper, green onions, avocado, cilantro, and green olives. But if these ingredients don’t suit your tastes, feel free to make substitutions or leave any of them out. Then the vegetables are seasoned with ground cumin, lime juice, TABASCO® Brand Pepper Sauce, and olive oil. You can make this dip right before you want to eat it or make it in advance and refrigerate it until you’re ready to serve. I love it with tortilla chips and extra TABASCO® on the side. Black Eyed Pea Dip is perfect for holiday entertaining and game day spreads. Like Texas Caviar or Cowboy Caviar, this dip tastes great scooped up with tortilla chips. And you can serve it with other favorites like Guacamole Veggie Burgers and Grilled Potatoes. Or offer your guests an assortment of salads like Quinoa Vegetable Salad and Mediterranean Cucumber and Tomato Salad for a make-ahead meal. However you serve it, this recipe is sure to be the hit of the party! Now it’s time to make Black Eyed Pea Dip! Black Eyed Pea Dip is perfect for New Year's Day or any time of the year! This healthy dish is made with corn, bell pepper, avocado, and a tangy dressing. Combine all the ingredients in a large bowl and gently toss to combine. Cover and refrigerate the dip until ready to serve. Enjoy with tortilla chips and extra TABASCO® Sauce, if desired. Happy New Year! Thanks for trying my recipe! I like the way you think! I already have some black eyed peas ready to bring in 2017! Maybe it will bring you good luck in 2017! Thanks, Sarah! I’ll be making it again this year. I got a bag of Lucky 2017 Black Eyed Peas from Rancho Gordo ready to go! So easy and so delicious! Thank you for this great recipe!